There I was, minding my own business and eating a rather tasty pasta dish that Claudia had concocted - when a certain person decided she wanted a taste! Fortunately, I had more or less finished. Claudia took a series of pictures of Siouxsie digging into my dinner - and another few of her on her armchair a little while later, licking her paws in a very satisfied fashion. As you can see! A little while earlier, Siouxsie had been tucking into a bowl of grated parmesan cheese. 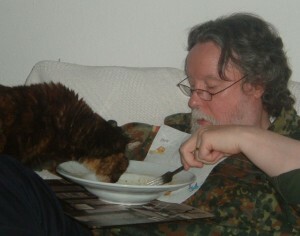 That cat will eat anything - except ordinary cat food. You have such a pretty cat! My cat will eat anything as well. Her favourite food is corn on the cob! Very pretty cat. My cat Shadow only likes his food, but our barn cats will eat anything, we give them leftovers. They come running when my mom goes out to the barn with a dish around dinner time. what type of cat is siouxsie? AFJ. 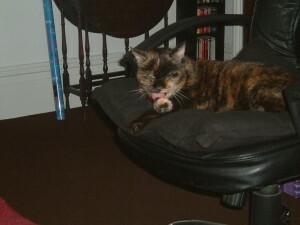 Liz - Siouxsie is a domestic shorthair tortie (tortoiseshell). that is so adorable! she is very pretty. hahaha that is so funny! XD my cat loves ice cream. ur just like;what? Siouxsie is so cute. And apparently a bit mischievous. She sounds like the perfect companion. What was going through your head when that happened? AFJ. Sophia - I was probably thinking “typical!” and feeling relieved that I had eaten most of it before she arrived. Mind you, I used to keep gerbils - and I gave them the run of the living room. And one evening I was eating spaghetti Bolognese, when one of the gerbils raced up the back of the couch, over my head and dived head-first into my plate. At least Siouxsie has never done that…well, not yet anyway. Hahahaha!! :) The food must be delicious at your house if you have animals literally climbing the furniture for a taste! AFJ. Well, the human food is very nice - Claudia is a great cook - I’ve never tried the cat food…or the gerbil food, for that matter. Although when I was a kid I used to eat dog biscuits and everyone would go “ewwwwww!” I thought they tasted fine, although I don’t really feel like trying them again now. Allan-have you ever had any other pets other than cats and gerbiles? mabey you had a dog? or did you just go out and buy dog biscuits for yourself? AFJ. Daniela - we had dogs when I was younger and rabbits when I was too young even to remember except that mine was called Hetty and lived in a hutch in the garden. We had a Boxer dog called Bruno when I was a teenager. I’ve pretty much always had cats, though. My own first cat was called Pawspauseporespoursmittenquasimodotractionengineofcamberwelllimited - but we called her Paws for short. then I had Pola Negri, named after an old star of the Silent Movies. Then Merle Oberon and Siouxsie Sioux. The dog biscuits belonged to Bruno and were bone-shaped and called Bonios. As for other pets, I’ve always fancied a tapir - which is a big deer-like animal, only rounder and with a small trunk. Tapirs rule! Tricky to keep in London, though. A few years ago, my puppy Izzy jumped up onto my chair onto the table and started eating my Philly Cheese Steak Hot Pocket. It was my favorite and that was the last one. Then, my Pop-Pop fed her Pecan Ice Cream. We spoil her. Wow… where on earth did Paws’s name come from? I’m glad you shortned it, otherwise I would never be able to read it! I like Paws’s name. It’s very unique. AFJ. With regard to Paws’ name, it all started because I bought her about the time the Movie Jaws came out, so Paws seemed a cute name, but I couldn’t decided how to spell it, so I spelled it every way and added the different ways all together. My girlfriend of the time wanted to call her “Mitten” - (Mitten Kitten in full) so I added that,. I added “Quasimodo” - because that’s the name of the Hunchback of Notre Dame - and she used to arch her back like she had a hunch. Traction engine is because she made a noise like a steam driven traction engine when she purred. of Camberwell was because we lived in a place called Camberwell at the time. And ‘Limited” because I thought it would be a good idea to make her a corporation! See? Simple! Wow. It’s not just unique, it’s brilliantly amazing! I think I might just love that name itself. mr allan how do you remember how to spell it?! Hi Allen your cat is cute. I also have a cat and he is also cheeky. HE likes some human food as well. Though he does not like mince meat. She must keep you warm during the winter months. Keep well Brigitte. AFJ. Daniela - I just think the spelling got stuck in my head somehow. It’s easier to pronounce if you think of it as a bunch of separate words. Paws. Pause. Pores. Pours. Mitten. Quasimodo. Traction Engine. Of Camberwell Limited. Easy! hmmmm….. nope cant do it. practice makes perfect! i hope. pawspauseporespoursmittenquasimodotractionengineofcamberwelllimited…… when u would say the cats name did u say the whole think??? hahaha how cool! AFJ. I only used Paws’ full name when I was cross with him. The problem was, that by the time I’d said the full name, Paws had wandered off. When Claudia and I were first together, the Post Office did some kind of survey, and they sent us a letter addressed to Mr A & Mrs C Firwig. (Someone had seen our name written and had misread it!). We thought that was a great name - Firwig. Some years ago I’d been watching a programme on Tv about Roman times. There was this scene where a mother was calling her children. it went: “Agrocrytes! Clytemnestra! It’s dinner time!” I thought those were great names - plus they had the same initials as Claudia and I. So we often refer to ourselves as Agrocrytes and Clytemnestra Firwig. you’re cat is so cute! i luv those pictures!